The quick reference guide below is relevant for growing potatoes by any method you choose, you don't need a huge garden. Growing potatoes in bags, tires, straw-bales are but a few ways for the home gardener with a small area to enjoy the fresher, more flavorful taste of home grown potatoes. The growing potatoes quick reference guide below is designed as a quick overview of growing potatoes. For more details on the different stages from seed to harvest go to the related pages link. 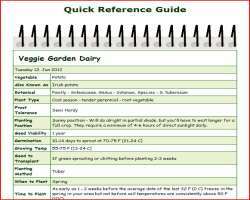 Follow this link for a Printer Friendly version of the Quick Reference Growing Potatoes Guide that you can combined with other vegetable quick reference guides into a handy garden shed booklet. Plant Spacing Plant tubers or tuber pieces - 10-12 inches (25-30 cm) apart in rows 24-36 inches (60-90 cm) apart - cover with 4-6 inch (10-15 cm) of soil. When to Fertilize 2 weeks before planting - side-dress at 1st sign of flowering.